Whoa. So this is illegal now? Folate, a water-soluble vitamin, helps the body form red blood cells and aids in the formation of genetic material within every body cell. But bizarre and useless U.S. food laws say that the only foods that may contain added folic acid are breads and cereals. 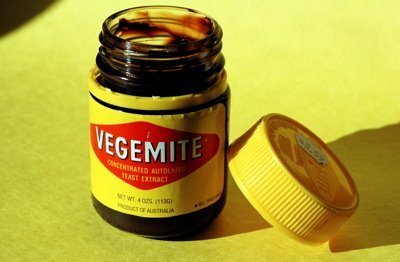 Therefore Vegemite is banned, as of now. Um. Did you know strawberries and asparagus are good sources of folic acid? Liver? Sunflower seeds? Beans? Better not add any of those to your menu. Pshaw. I find it ridiculous, and I'm going to go have a contraband sandwich. I figure I can get this jar to last me a little while longer; already, it's been in my pantry for — oh, gosh — years? Then I'll probably have to switch over to Marmite, if that's still allowed. Man. Sometimes I'm just embarrassed to be American. UPDATE: Or maybe this whole kettle of concentrated autolyzed yeast extract is just one big misunderstanding. Thanks to a tip at Cooking With Amy, I clicked through to this story, which concluded that it is the Kraft corporation that has discontinued importing Vegemite because of a misreading of the FDA regulations. If that's true, the bottom line is still: No Vegemite. Ants are another source of folic acid. Hey, Kevin: Well, I would have thought formic acid, surely, but folic? It'll mean war if they ban Marmite. I'll walk down 5th Avenue in a bearskin with a union jack and the biggest pot of the yeasty good stuff I can find and reclaim the place for Queen Bessy!!! MG - now that, I gotta see! ps- got the seeds today, thanks! I think the govt was trying to ban that letter too... you should see the state of the envelope... all rumpled! the smell was devine! Stacie: Good. The envelope was probably mangled by a fennel-seed sniffing dog. I hope you find a good use for them. So I guess we won't have anymore imported fruits and vegetables as well, huh? Well, local farmers should be rejoicing. Dagny: Not sure about that. I think it's a federal regulation to allow bread and cereal producers some kind of designation; it's just "added" folate they're policing. Fruits and vegetables should be fine. Oh, especially if they're GMO or irradiated. ha. this one i hadn't heard about. jeez, what will our country think to ban next? at least i have "I'm Mad and I Eat" to keep me up to date on outrageous US Food Policies. sigh. Oh, man, I just blogged about this, before I saw your post. Interesting. So that's what a vegimite sanwich is.. go figure.